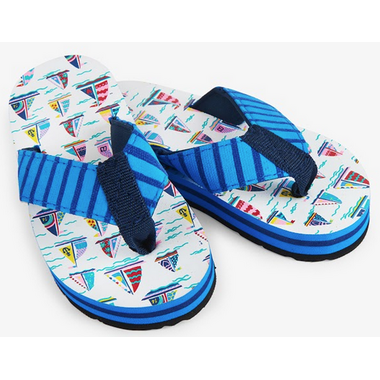 Let the summer fun begin in these pretty sailboat print flip flops. Easy to slip on and off they are perfect for going to the pool or the beach. Small: size 7, ages 2.5-4, 6.25"
Medium: size 9. ages 4-5, 6.75"
Large: size 11, ages 5-7.5, 7"